Today at Facebook’s f8 conference in San Francisco, CEO Mark Zuckerberg took the stage to unveil the next evolution of the service. The first major change? The Profile. Zuckerberg noted that the original Profile was sort of like the last five minutes of your life. The updated Proile from 2008 extended that to show what was sort of like the last 15 minutes or your life. The new Profile unveiled today is “the rest,” Zuckerberg noted. He calls this feature Timeline. And it goes all the way back to when you were born. Trying to display all of this content was a major design challenge, Zuckerberg noted. How do you do it all on a single page? Well, all of your recent content is shown in a new grid-view. But as you go back in time, it’s more about summarizing your content to display the most important content. The farther back you go, the less you see — it’s just the key moments. 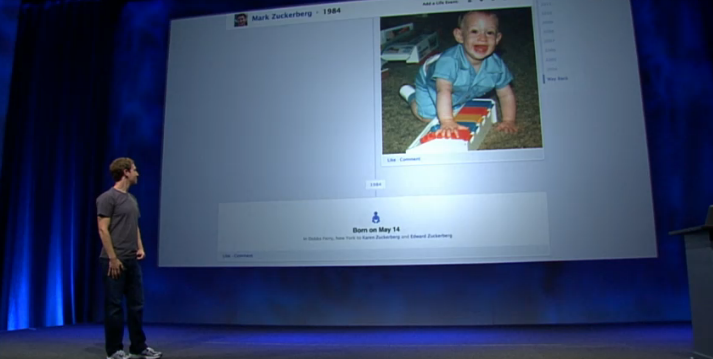 “This is the magic of how Timeline works,” Zuckerberg said. And it works on mobile too. 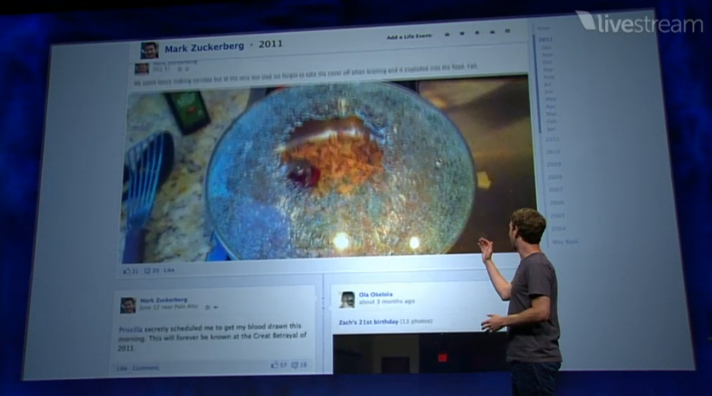 While Zuckerberg mainly showed off how Timeline looks on the web, he also showed it on the smaller iPhone screen. It’s the same idea, just more condensed. “We wanted to design a place that feels like your home,” Zuckerberg said. Undoubtedly, this will roll-out over time (over the next couple of months, CTO Bret Taylor says). You can learn more about Timeline here. Update: Here’s what Timeline looks like.